Denmark's Djurs Sommerland has announced a major addition for next year, Juvelen (meaning Jewel), which is a double-launch Intamin motorbike coaster. The park had been teasing the ride for some time, showing off construction photos and footers being poured, but now they've revealed all. Well, mostly everything that is. The ride's trains will be themed to off road ATV looking contraptions, with normal seating instead of the motorcycle position. The ride will travel through a heavily themed jungle setting, and if the concept art above pans out it should be fairly impressive. 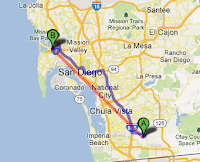 As for the ride itself, the track length will be just under 3,300 feet long, and reach a top speed of 53 miles per hour. The park has released this video showing off the layout. The video is simple and just meant to show the basics, so hopefully this family ride will look considerably better when it opens! Reaching the highest point of any new ride is always a well documented milestone, and that is no different for Cedar Point's GateKeeper, which reached its apex this evening. With the top of the lift hill in place GateKeeper now stands a full 170 feet tall. 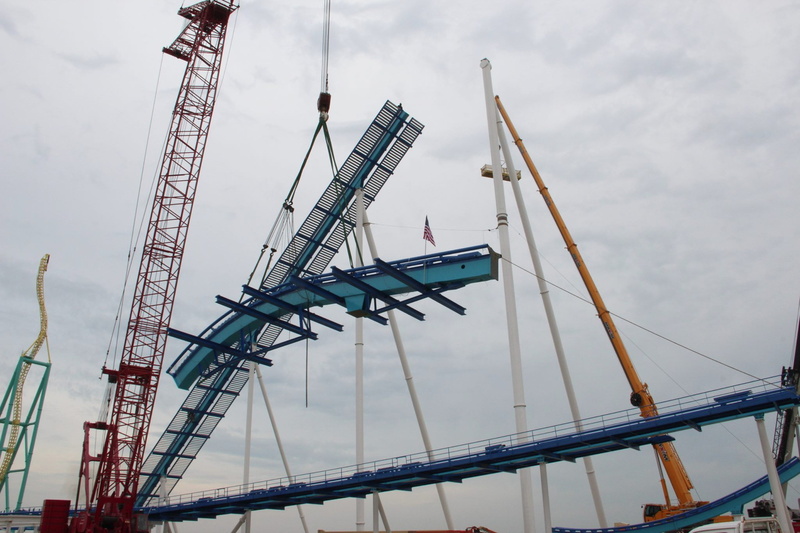 The ride will quickly invert riders at the top of the lift, and then they will dive downward in a large half-loop. At the pace that GateKeeper is going up (which is actually quite typical for B&M rides) I think we will see that first inversion and 164 foot drop in place sooner than later. In addition to a couple shots from the park's official Facebook page, the Great Ohio Coaster Club has a set of photos sent in by the park. 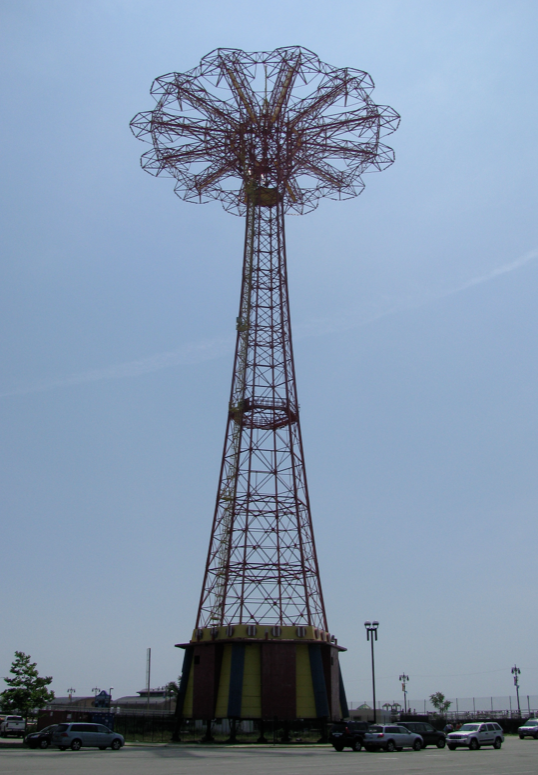 According to news sources, Coney Island's famous Parachute Jump tower may be quite a nighttime spectacle starting this coming Summer. If approved by the Landmark Preservation Committee, the 262 foot tall structure will be adorned with over 8,000 colored LED lights. When used together they will be able to perform a light show synchronized to music, perfect for holidays and other special events. 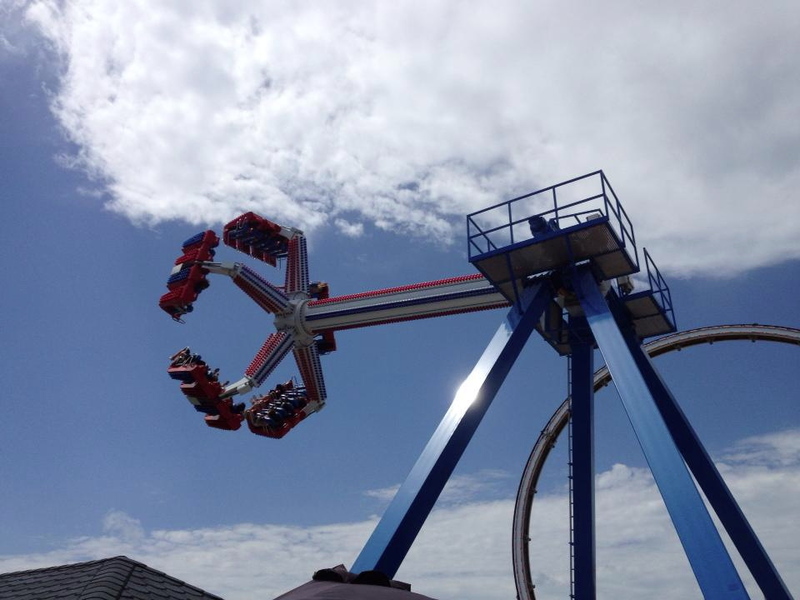 The project will use $2 million from the city's development funds, and be installed by Zamperla's Central Amusements, the company that runs Luna Park and Scream Zone, just a short walk up the boardwalk. The Parachute Jump tower was first built for the 1939 World's Fair, then moved to Steeplechase Park a couple years later. It hasn't operated in decades, but remains a Coney Island landmark. As Coney Island struggles to rebuild after Sandy, this will quite literally be a bright spot for the city next year! It looks like rides and attractions aren't completely dead in Las Vegas, after all. 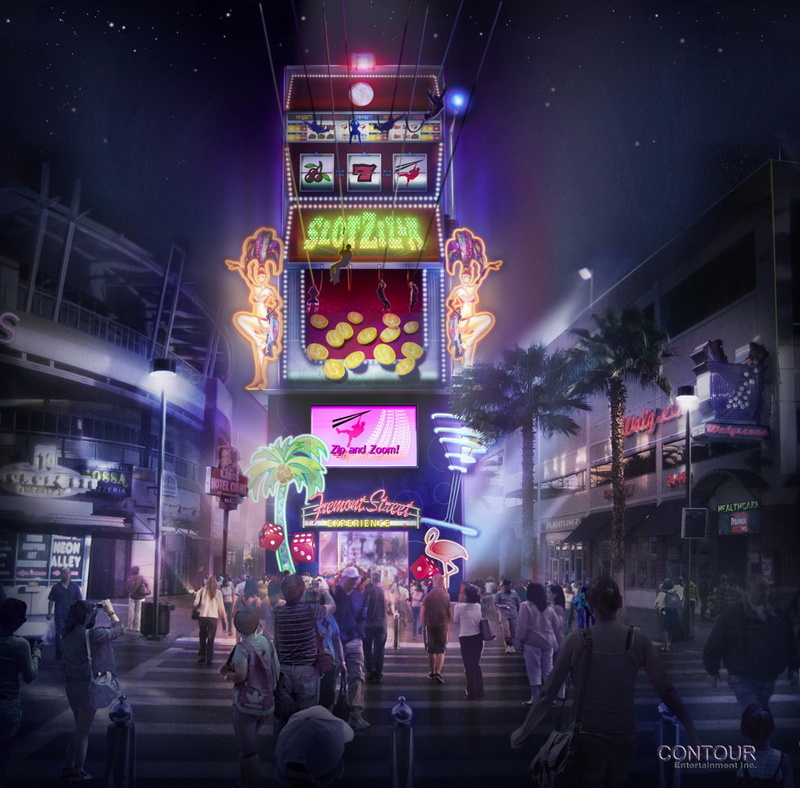 Downtown Las Vegas' Freemont Street Experience has announced a new high-flying attraction that will have everyone looking up next year: SlotZilla. SlotZilla will cost a pretty tremendous $11 million to build, and will stand over eleven stories tall at its peak. The ride will feature not one but two different sets of zip lines that will send passengers soaring over Freemont Street. According to developers each time a rider departs the giant slot machine arm above them will pull down, and the reels will spin. Obviously from the art the departure point for the ziplines will be a spectacle on its own. The upper ziplines will be known as the Zoomline, and take off from 100 feet in the air. Passengers will actually lay in a harness for that one, making their flight of over 1,700 feet much like that of Superman. The lower paths, known as a fitting Ziplines, will depart from 70 feet in the air, and stretch 850 feet to their landing point. It sounds like riders will soar in a more traditional zipline position on the lower level. The entire structure and the lines are expected to open in June, 2013. 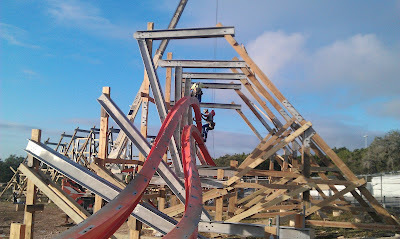 Wow, things are really continuing to move quick over at California's Great America, where Gold Striker construction rages onward, and quite literally upward. The park has started to build the lift hill for their new Great Coasters International ride, and at this point the only major elements left to complete are the lift, drop, and first turn segment. It appears as though the footer sections for those elements are nearing completion, so it won't be long until the ride is complete. The aerial photo above that the park has shared really gives an idea of the high banks and other features that Gold Striker will offer riders. Really looking forward to this one! Pennsylvania's Patriot News has a feature on Hersheypark's new leader and CEO, William F Simpson, Jr, who will replace Ted Kleisner, who is retiring at the end of the year. Mr Simpson's new role will include presiding over the entire Hershey resort destination, including the park, hotels, restaurants and other recreational facilities. With a new leader always comes new changes, a few of which are already being spoken of. Two restaurants, both at Hershey branded hotels, will be renovated into new concepts starting next year. 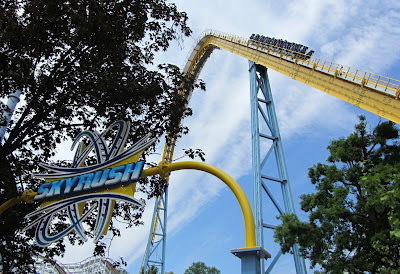 As for Hersheypark, of which we are all very interested, the article mentions that park visitors always request more coasters and water rides - and with Skyrush just having opened that means we can probably bank on a water park expansion sooner than later. Speaking of Skyrush, it sounds like it did not give the park quite the banner year they expected, but that's probably more a reflection of the economy more than anything else. The article states the park did around 2.5 million guests in 2012. While the park has denied so thus far, rumor has it that Roller Soaker will make an exit from Hersheypark at some point soon - so that'll make some nice new space for a water park expansion. Only my theory, of course. With more and more new Google 45 degree images appearing, suddenly I have plenty of new parks to feature here in Aerial Antics. A prime example of this is Lake Winnepesaukah Amusement Park, or just Lake Winnie as it is commonly referred. And there's the lake that gives the park its name! 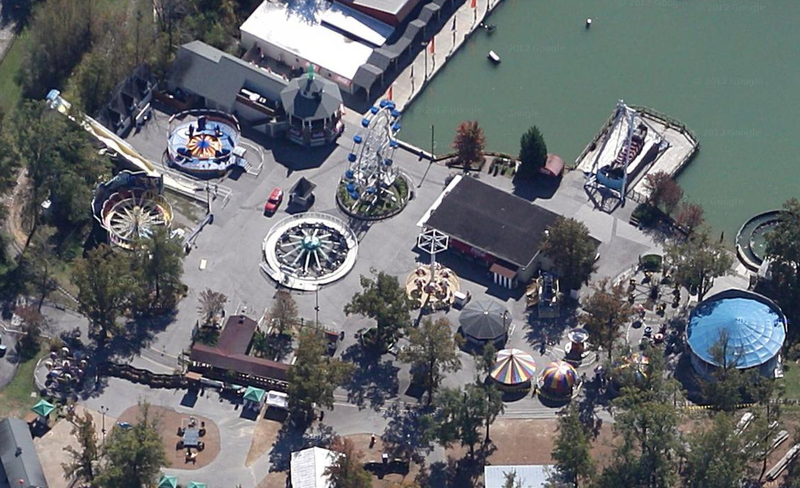 Lake Winnie is built around the water, with rides lining midways that extend on three sides of it. The park first opened back in 1925 or so, so there has been a lot of development over a long period of time - traditional amusement park by design you could say. The park offers an impressive collection of flat rides, a large portion of which can be seen above. There's the classics like a tilt-a-whirl, sea dragon, and mat slide aside plenty of others - big and small rides mixed together. The park takes advantage of its lakeside location to the fullest, with some rides and attractions over the water. The Wacky Factory is in the center of the photo, which Scott & Carol covered and visited when it opened in 2011. There's a Wacky Worm hiding among the trees behind the Wacky Factory, if you look close. This park is too wacky! One of Lake Winnie's oldest rides is the Boat Chute, an original mill chute water ride and the oldest operating one in the U.S. The boats plunge down toward the lake and then skim across the surface, before moving back to their leisurely pace. 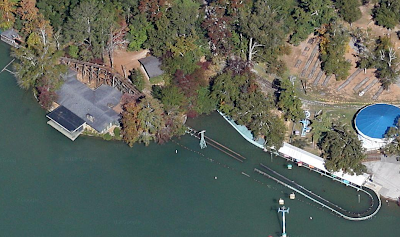 The Cannon Ball is Lake Winnie's big ride, a John Allen designed wooden coaster that opened in 1967. The ride is about as a traditional out and back as they come, filled with plenty of air-time hills along the way out... and back, of course! Pretty nice looking, right? 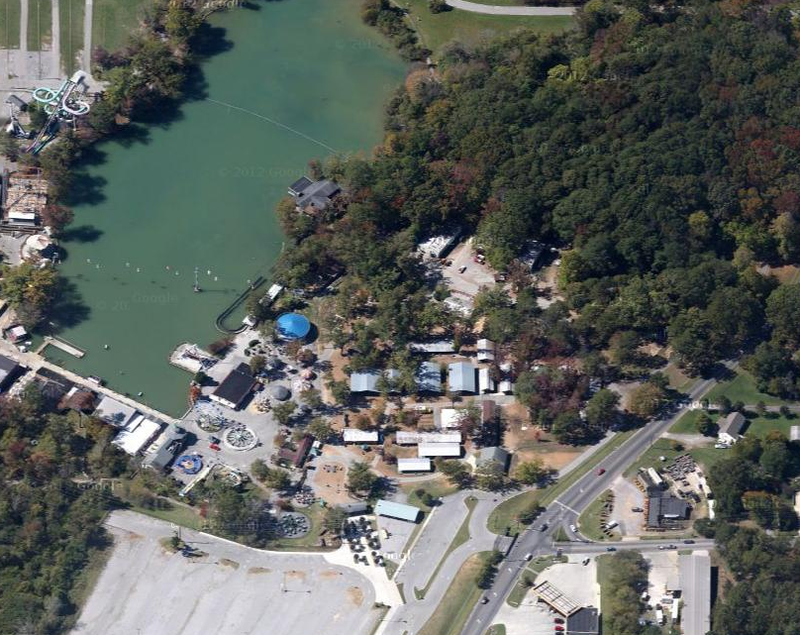 I have a feeling that the water park addition is going to be a huge success for Lake Winnie. 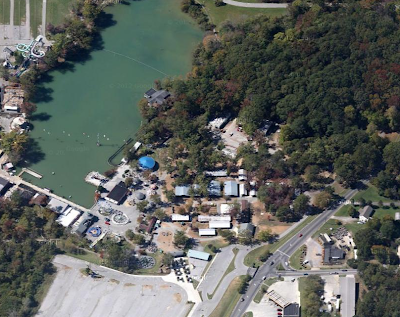 Here is a link to Google's aerials of Lake Winnie if you'd like to look around. 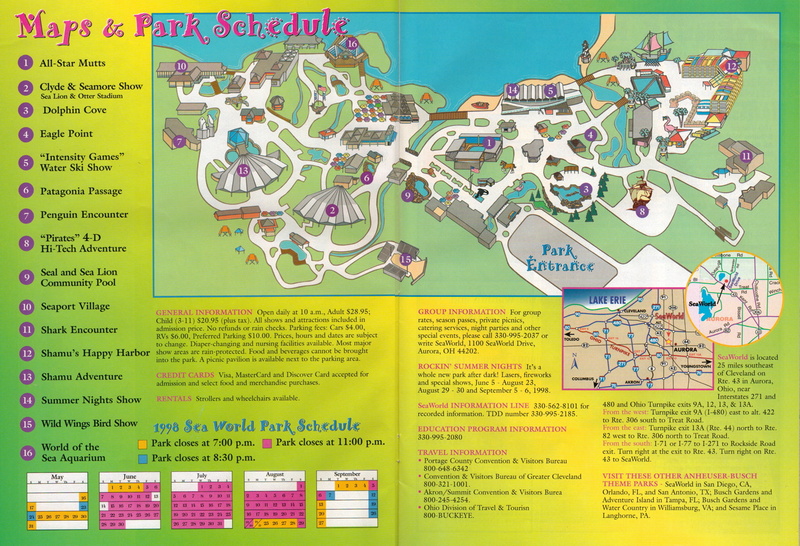 As promised from last week's Vault, here is the SeaWorld Ohio trip planning booklet from 1998. The park is now known as Wildwater Kingdom, and besides perhaps some fish no animals call this place home anymore. 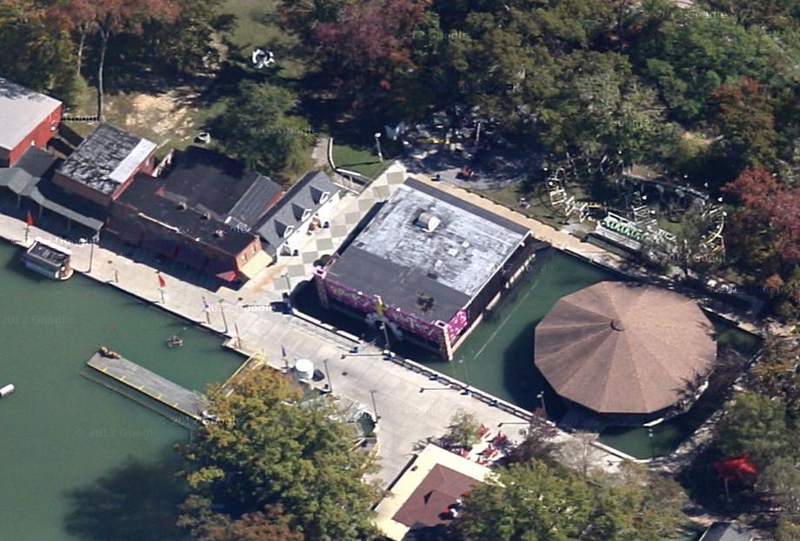 SeaWorld Ohio first opened in 1970, directly across the lake from then Geauga Lake. A part of the Busch properties, it thrived for some time, eventually being sold to Six Flags, and then to Cedar Fair - which marked the end of animals at the park. 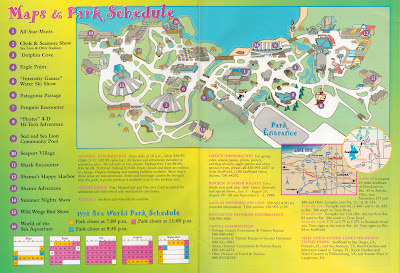 Instead it was cleared out and water attractions were moved or built, and today it still operates as Wildwater Kingdom. That's the park history in one minute or less. 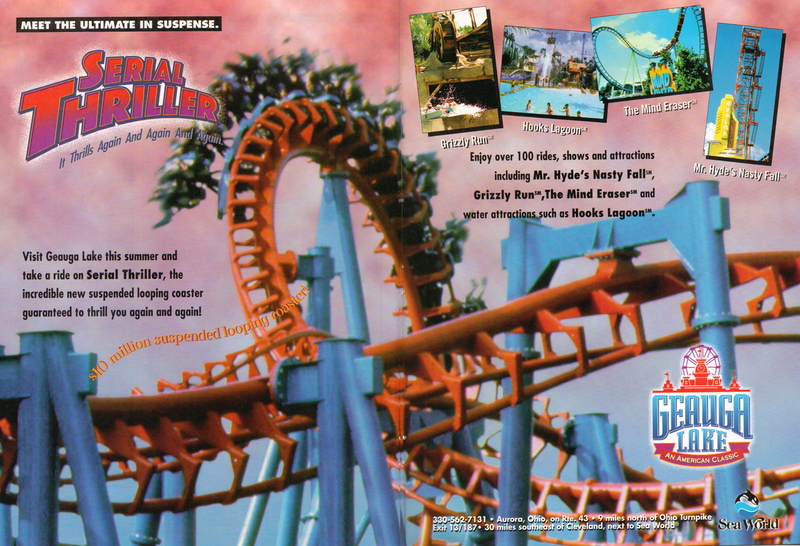 Here we see the cover of the booklet, advertising plenty of New Sensations to experience at the park. What was new? Let's see! 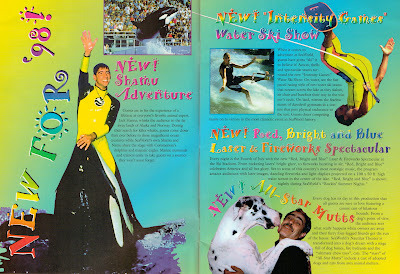 There really was plenty new in 1998 for guests to check out, the biggest of which was the new Shamu Advenutre show, presented by Jack Hanna and featuring the park's killer whales, Shamu and Namu. A popular part of SeaWorld Ohio was the water ski show, and there was a new one this year named Intensity Games. I wonder if it was anything like Hunger Games? The park also celebrated each night like it was the 4th of July with the Red, Bright and Blue laser and fireworks spectacular. The show utilized a huge water screen in the center of the lake that had lasers displayed on it. And we must not forget the pooches, they were the main draw of the all new, All-Star Mutts show. As a marine life park, most of the shows featured animals as the stars. 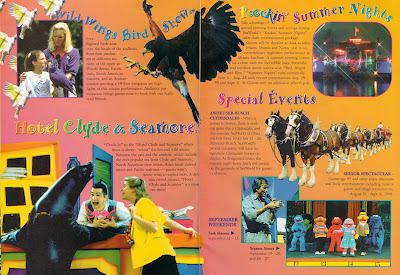 Such was true of both the park's bird show and sea lion show, who was home to Clyde and Seamore. To keep guests busy into the evening hours, the park presented the Rockin' Summer Nights show, a special evening killer whale show at Shamu Stadium. As with other Busch parks at the time, Jack Hanna often visited for special events, and the tie (which has grown considerably stronger since then) with Sesame Street can be felt. If I remember correctly, the SeaWorld Parks added the word "adventure" to their name around this time, and that was the start of more traditional amusement rides being added to the properties. 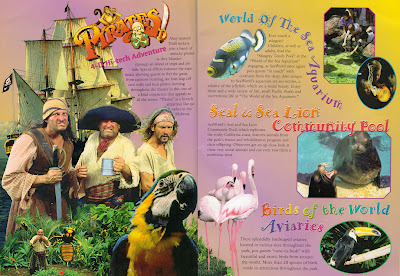 SeaWorld Ohio had a 4-D theater that was showing Pirates! 4-D Hi-tech Adventure at the time. 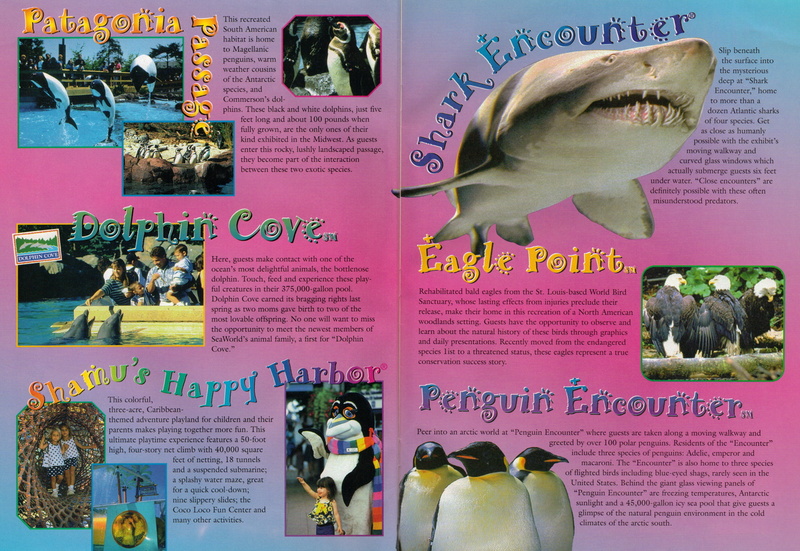 An aquarium and outdoor sea lion pool were also highlights, and I believe a dolphin area was transformed into a water activity area, and part of the lazy river, when the water features took over. Shark! The amount of different animal exhibits was pretty neat, and much like those at the other SeaWorld parks. 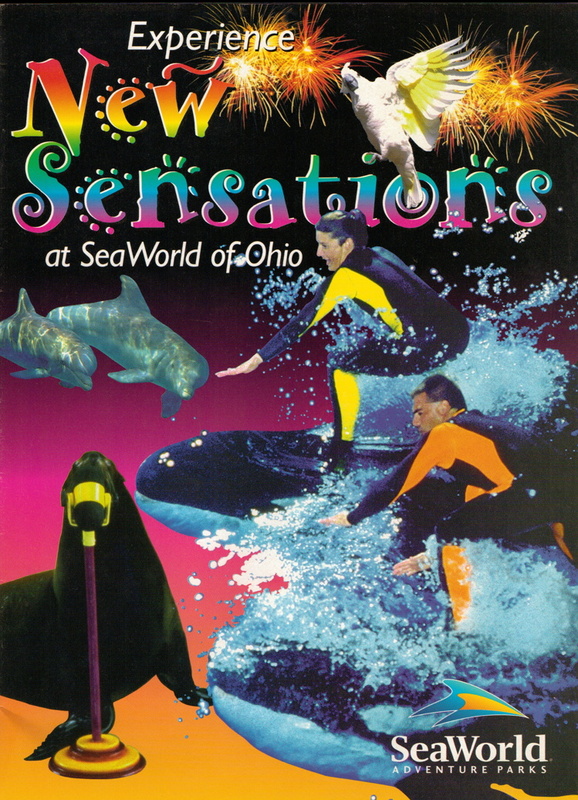 Many remember SeaWorld Ohio as a small park, and lesser than its siblings, but its atmosphere and selection of attractions made up for that, I think. The locations was pretty nice, too. I remember sitting in Shamu stadium watching the Big Dipper rolling across the lake and thinking why, oh why, did my family pick this over Geauga Lake?! Now I'm just happy I visited at all. Things are quite different these days. Both of the park's large stadium theaters are gone, one has turned into a wave pool. The water ski stadium is now home to lounge chairs, and the Eagle Reserve is home to a really rather tall tower of water slides. Not all of the former SeaWorld Ohio park is used, though, on the right side where the 4-D theater, shark encounter, and Shamu's Happy Harbor play area once were is now closed off and slowly rotting. On the left part of the park everything above the former sea lion stadium is closed, including the former aquarium. I've always thought it was odd that the former bird show theater is still standing, if for no other reason than the value in the aluminum seats. 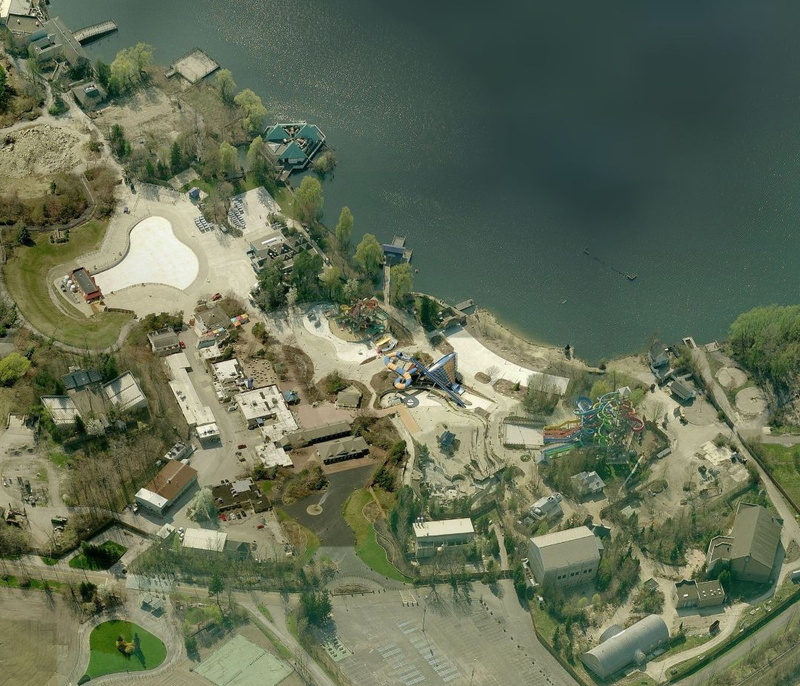 With a second phase originally planned for Wildwater Kingdom, then later canceled, perhaps more of the park will eventually be developed. And perhaps not. I've had this article open in my browser for a couple weeks now, meaning to share it with you all because it contains some pretty interesting information. At least I think so. Coasters and More did a great write up on the EAS, as it is known, which is the European version of the IAAPA show. It's smaller, but quickly growing and most of the big manufacturers are there, which means that plenty of news leaks out. If you click through and read the full story, you'll see what I mean about interesting news. Take for instance the fact that Gerstlauer is transforming the Schwarzkopf flywheel launch Turbine at Walibi Belgium into an LMS launch, complete with brand new trains. Or that Mack rides has sold a clone of Blue Fire, and Vekoma a Dive Pretzel Coaster, that crazy looking thing that was proposed for the Orlando Thrill Park. On the water cooler talk side of things, the article also reports that a lot of attention has been going to Dynamic Attractions, a company that has been in the industry for decades, quietly building the hardware for some of Disney and Universal's most impressive attractions. From the Soarin' theaters to full Space Mountain track replacements, they've done them all. The original founder of Premier rides is with them, and it sounds like they're ramping up to become a much better known supplier in the industry. Their motto is "Anything you can Dream. We can build" after all. Regardless, check out the story and read all the details! Santorini Water Fantasy, a new water park opening in Thailand that is being build adjacent to the Santorini Amusement Park, is being supplied entirely by Polin, the company has announced. "Santorini Water Fantasy will open next spring as an exciting new aquatics addition to Santorini Park, an amusement park adjacent to the Cha-Am Premium Outlet Mall. Located in the southern part of the Phetchaburi Province in central Thailand, the new waterpark, as well as the existing amusement park and retail center, is the brainchild of Supoj Tantichirasakul, chairman of Pena House Public Co. Ltd. and its subsidiary." "Santorini Park Cha-Am's concept has been well-considered," Tantichirasakul says. "The product, location, atmosphere, thrill rides and everything that we selected were of the highest quality, as well as being appealing. It should be looked at as a long-term project." 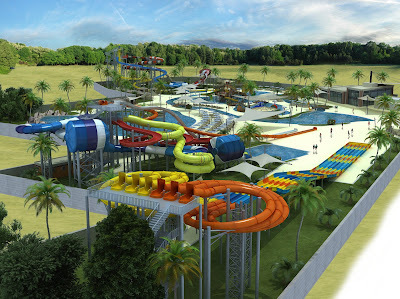 The water park will sit on about 4 acres and will require an investment of US $3.25 million. The existing park sits on about 8 acres of an existing 23.7 acres available. The group plans to add another 8 acres adjacent to the site and also build a three-star, low-rise resort with about 150 rooms. The project is expected to be completed next year. The existing amusement park is themed after the Greek island of Santorini. More than US $1.62 million was invested in the site's architecture, sculptures and dancing fountains. It already draws as many as 10,000 visitors on its busiest weekend days. The majority of guests are from Bangkok; about 10-20 percent are tourists. The park consists of five main zones: a park, village, rest area, event area and Sunday Art Market. 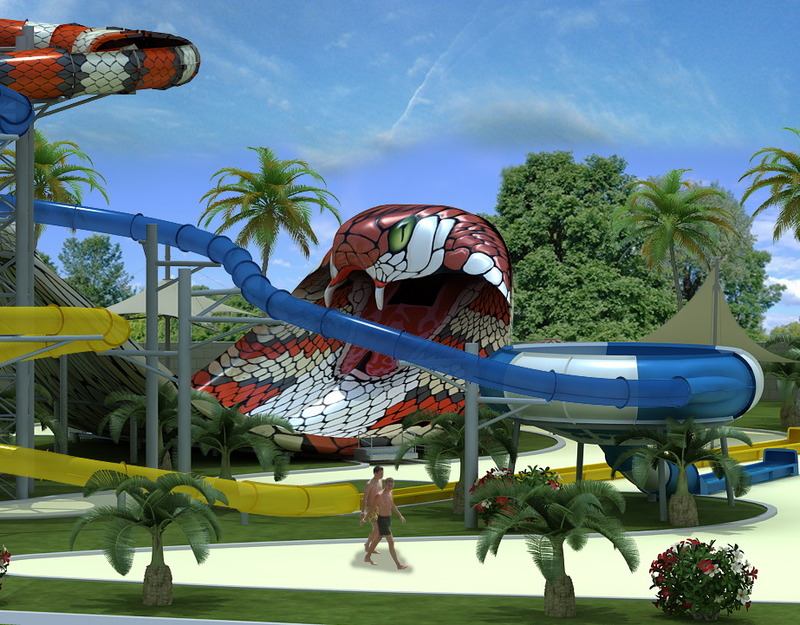 King Cobra - Featuring bold red, black and white scales, the ride's imposing veneer extends along its massive 50-foot height and 260-foot length. The slide features fog, sound, lights and a unique configuration that enables two riders to race along a circular path of twists, turns and surprises. Riders reach speeds of up to 32 mph via water pressure of 3,875 gallons per minute through open and closed tubes. The ride ends just after they endure a heart-pounding plunge of nearly 25 feet down a 50-degree slope. Looping Rocket - This high-adrenaline ride offers one of the highest drops riders can experience. The ride features Polin's exclusive "Magic Shine" technology in translucent colors. Space Shuttle - This waterslide features an innovative design configuration, form and ride path. Fully open, fully enclosed and half-closed versions are available. Configuration options include exit via a pool or a run-out. Windigo - Riders on mats begin this attraction within enclosed slides that transform into high-speed multi-racer lanes. It offers the flexibility of including "Kamikaze" or "Freefall" options, and its high-capacity capability will keep lines moving. Happy Thanksgiving to all you NPN readers! We're thankful for you, for without you guys we'd be publishing for the endless empty depths of the interwebs! While I have plenty to be thankful for in my life, I thought it would be fun to take a purely personal look at some things I've been thankful for so far this year, industry related of course. Here in no specific order is a lighthearted look at what I'm thankful for. • Skyrush! Hersheypark's top notch intensity monster gave most coaster - and Intamin - fans something to be thankful for this year! I'm thankful to have the coaster and Hersheypark so close to me. • Legoland Florida's successful first season, with the opening of the water park and several small expansions already underway. Many thought the park was too out of the way to work, and I'm thankful that the opposite has proven true. • The Magic Kingdom's New Fantasyland. Whether it was designed to counter Potter or not, the level of quality and detail in the area is something that Florida Disney parks haven't seen in some time, thankfully. • Verbolten! We're all still a bit sad about the loss of the Big Bad Wolf, but I'm thankful that the debut of Verbolten has helped ease that pain. Busch Gardens reimagined the coaster for the current century, and created a family thrill ride that's totally one of a kind. 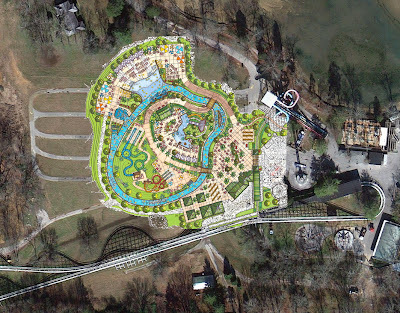 • Since the announcements were in this year, I'm being sneaky and counting the addition of Outlaw Run at Silver Dollar City and Iron Rattler at Six Flags Fiesta Texas. The extreme wooden hybrid coasters are so highly anticipated I'm not sure I'm looking more forward to them or today's big turkey meal! • I have acknowledge the 40th anniversary of The Haunt at Knott's Berry Farm, which thankfully has helped guide the way for haunts to pop up all across the country. Like it or not the Halloween season is a major portion of most park's seasons now, and I think everyone should give thanks to Knott's for that. • SUPERMAN Ultimate Flight! While the industry is constantly evolving, I was thankful to see a park work with Premier Rides to create an innovate coaster such as this. When working with such a small space, packing as much of a punch as Superman does was quite a challenge, no doubt. • Matt Ouimet's first year of leadership at Cedar Fair has given me plenty to be thankful for. While not all decisions made this year can be attributed to him, such things as Luminosity and multiple technology upgrades across the parks are helping to bring the company into present day - which it really needed. • The world's tallest free fall ride, at Six Flags Magic Mountain, I give thanks for thee. I love freefalls, and taking one as tall as was done for Lex Luthor: Drop of Doom (400 feet) is an achievement of large proportions. • Ride removals... they're at times a sore subject, but this year I think that they were great moves pretty much across the board. 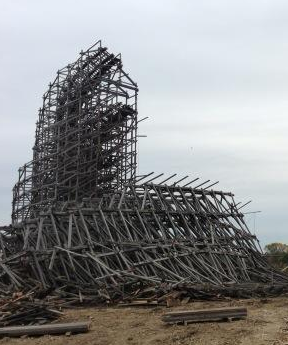 Putting Son of Beast out of its misery, removing tired (and ugly) rides like Disaster Transport, and ones that were troubled and didn't fit their park - ahem Perilous Plunge - were smart moves. So thanks! • Disney California Adventure finished up a really extensive transformation that has taken it from mega-flop to big success. Thankfully the days of the park being an embarrassment over - for that I'm sure we all will say phew! • I'm all for preservation of certain rides, and when one gets some love that really deserves it, I'm thankful. 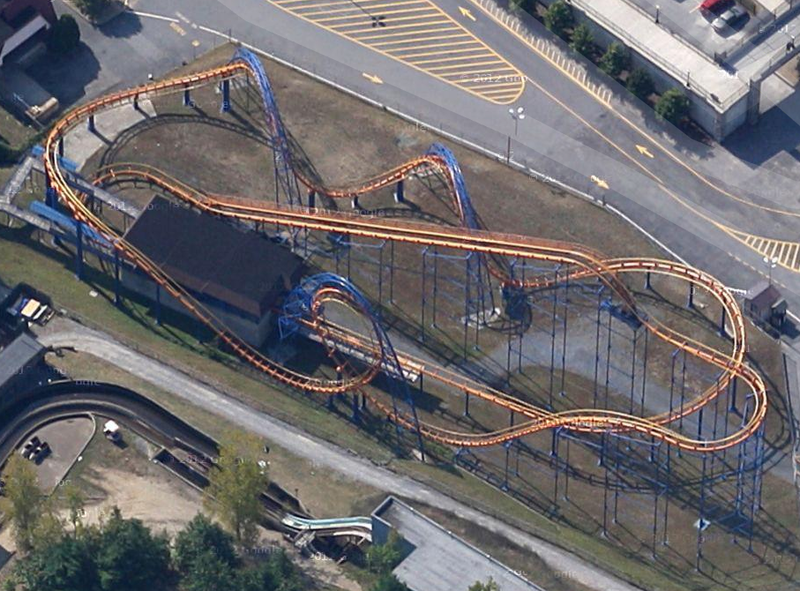 Such is the case with the upgrades done to sooperdooperLooper at Hersheypark this season. A new train, brakes, paint and more have the coaster running as well as its opening day! I shall stop there, as my appointment with a huge meal is quickly approaching. What are you guys thankful for? Be safe and enjoy! Crazy! That's the first thing I thought when I saw this photo that Six Flags Fiesta Texas released of the Iron Rattler under construction. Crazy in a good way, of course. The track is banked at what looks like 90 degrees, but take notice that it's not really during a curve, it's actually just banked that way on some straight track. I'm a little behind on this one, as the park posted it a couple weeks ago, but it's worth the repost in my opinion. Also, did you all hear that the industry-famous Jeffrey Siebert is returning to the ride side of things from the word of Schlitterbahn by becoming the Marketing Director at Six Flags Fiesta Texas? Mr. Siebert really became a loved industry professional when he worked at Kings Island, and with Fiesta Texas debuting a massive new coaster this year I have a feeling we will see some interesting things from him. Beech Bend Park and Splash Kingdom have been steadily adding to their ride and water attraction collection over the past few years, and have just revealed that they've signed on the dotted line for yet another thriller. A major benefit of the annual IAAPA trade show is that some parks indeed go shopping for a new ride, and are eager to make the purchase on site. Such is the case with Beech Bend owner Dallas Jones, who purchased a Chance Revolution for the park's 2013 season. 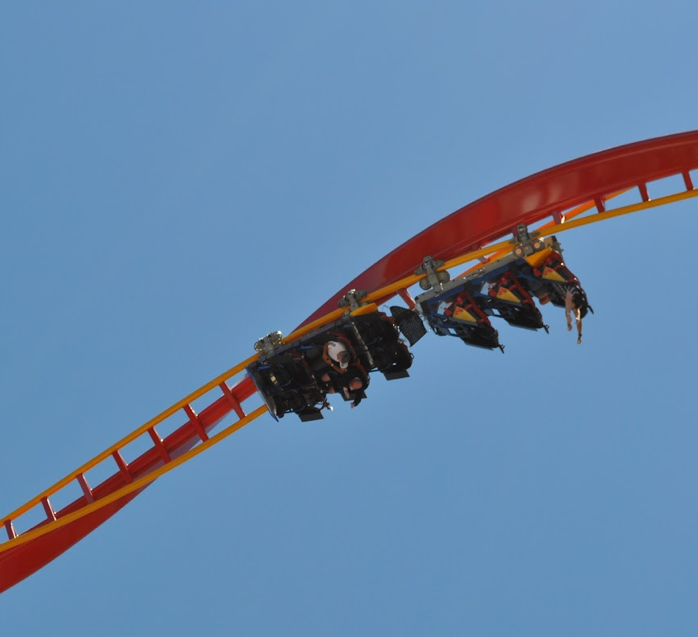 The ride, which will be named later, will send riders up to 60 feet in the air at a maximum swing angle of 240 degrees, well on the way to fully inverted. As the large arm swings back and forth riders, who seat facing each other, are rotated 360 degrees. To say the experience is disorienting is an understatement! Congratulations on the continued expansion of Beech Bend! In a surprise announcement, Cedar Fair has sold its Knott's Soak City San Diego water park to SeaWorld Parks & Entertainment for an undisclosed amount of money. 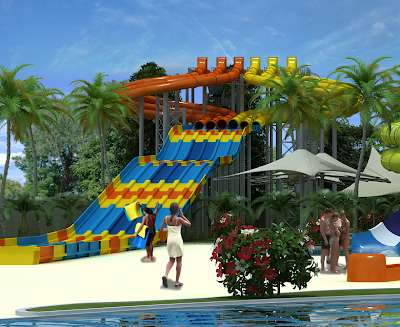 The water park will be heavily renovated and reopen as Aquatica San Diego next June. Aquatica San Diego will be the chain's third water park under that name, following the original park in Orlando and the Texas location which just opened this past Summer. While specific attraction changes have not been announced, SeaWorld Parks and Entertainment is clear to point out that animals will be added to the experience, as in the other Aquatica locations. "These parks reflect the highest standard of quality in attractions, entertainment and theming, but the presence of animals makes the experience something truly special. 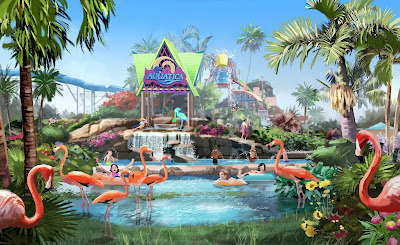 Aquatica San Diego, like its sister parks, will feature guest experiences with a variety of exotic animals," said Jim Atchison, President and Chief Executive Officer of SeaWorld Parks & Entertainment. "Having animals in our Aquatica parks adds an educational component to a waterpark visit that is both unexpected and enriching." Cedar Fair pointed out that the sale of this park has no affect on any of the company's other California parks and attractions, and the loss of operations from the property are not material. 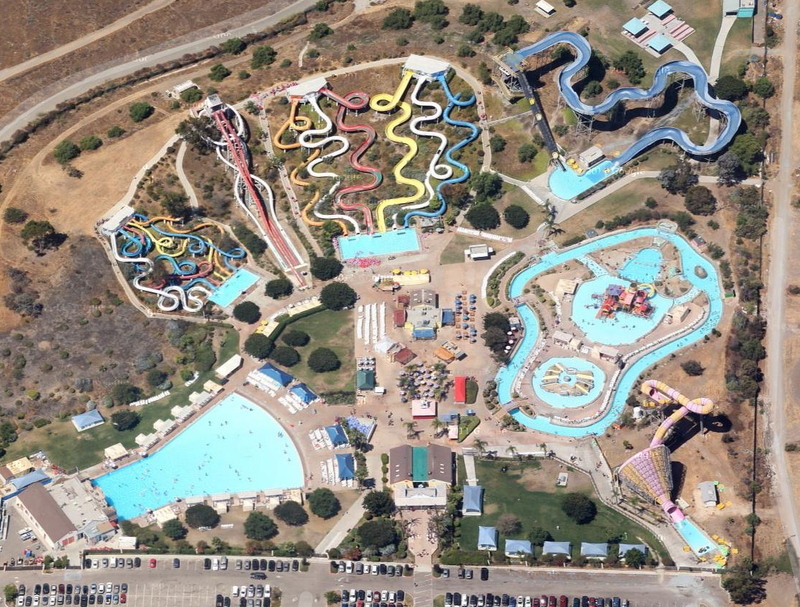 Soak City San Diego first opened in 1997 and was then known as White Water Canyon, Cedar Fair purchased the property in late 1999 after its owners foreclosed on their loan. Additions under Cedar Fair ownership have included a large family raft ride and Pacific Spin, a massive funnel slide. “For this particular property, a unique opportunity presented itself to team with SeaWorld to offer a premium product to its guests in the San Diego region,” said Matt Ouimet, president and chief executive officer. The proceeds from the sale will be reinvested in the company's "core assets," which will include the three year renovation of all the hotel properties at Cedar Point. The plan for an Aquatica to sit next to each of SeaWorld's parks is now falling nicely into place, a strategy that operators have hinted at in the past. When the first Aquatica opened in 2008 it quickly became a popular destination in the tourist haven known as Orlando, and it now averages a very respectable 1.5 million visitors a year. Aquatica San Diego will be located about 17 direct miles from SeaWorld Sand Diego, or about 22 driving miles. The addition of the water park will help make the property more of a destination, with the ability to sell multi-day tickets and the like. 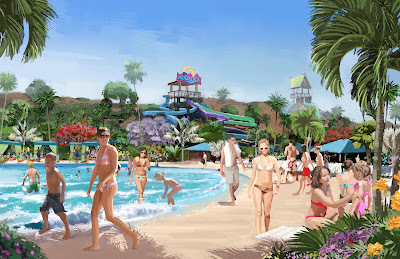 While Soak City currently has a beach vibe going on, we can expect that the lush tropical landscape that Aquatica is known for will replace that next season. Hopefully when new or modified attractions are out of the contract negotiation phase and can be released, we will learn more about what the new park will offer. The transition is already starting, with the Knott's Soak City San Diego website being stripped as I type, and the Facebook page already removed. SeaWorld Sand Diego just finished a very successful summer season that saw the opening of the multiple launch coaster, Manta, and recently announced an 18 month renovation of the park's entrance area that will totally transform and modernize the facility. 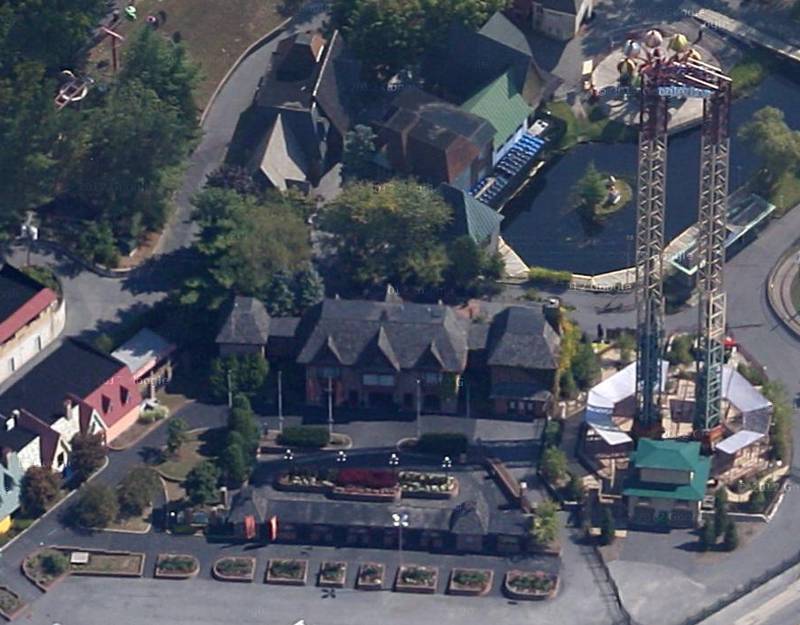 A reader recently alerted me to the fact that New York's The Great Escape theme park had some nice new 45 degree aerials on Google Maps (thanks, Chris!). Since the park has lacked a good aerial view for so long, let's dig in! The entrance to The Great Escape takes you directly into a quaint, small but cozy, main street area. It isn't so much a street as an extended courtyard created by the buildings, but it's pretty nice. I wanted to snap some photos of it when I visited this past Summer, but a thunderstorm told me otherwise. The park large S&S Tower ride stands adjacent to the entrance after being moved to the theme park from Six Flags New Orleans. As you walk from the parking area to the gates the Steamin' Demon looms over you on a hillside. The Demon has been thrilling riders with its double corkscrew and vertical loop since 1984. If you brace your head accordingly, it isn't so bad! The park's log flume uses the same hill to its advantage, taking the boats into a sawmill themed buildings before dropping them into the final splash. The flume travels around the perimeter of the large show building that once contained a coaster, named Nightmare. It also heads past from dilapidated western buildings that were once part of a train ride at the park, I believe. Six Flags transplanted this wonderful old Arrow mine train to the park in 2003 after it sat in a field for years, originating from Opryland. Named Canyon Blaster the ride uses two lifts, and is filled with odd transitions that are the signature mark of old Arrow mine trains, at least in my opinion. The landscaping is really quite above average on this one, too, filled with Western style props that were previously used in other attractions at the park. 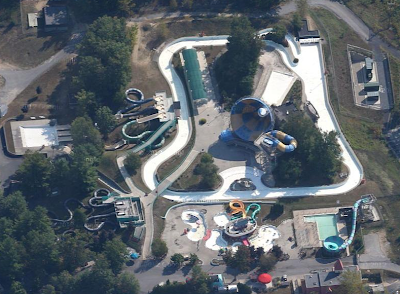 The water park at the Great Escape is one of its biggest draws these days, and it's separated into two sections due to the park's hilly terrain. 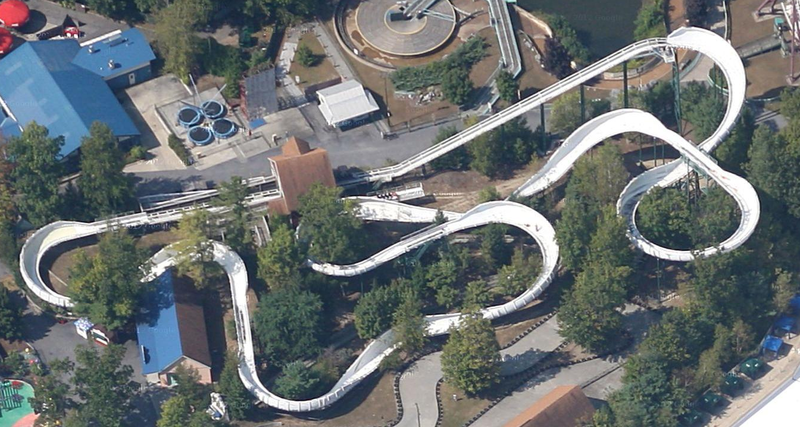 Here is the upper portion, which includes both a Tornado slide and Bowl slide bordered by a lazy river. Oh my it is a two-fer! 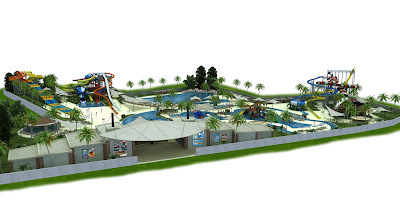 Here is the lower part of the water park, complete with the park's new set of twisting mat racer slides, part of the Alpine Freefalls, and a very large wave pool. Behind it, and framing the water park oh so nicely, is the Comet, the Great Escape's large wooden coaster. 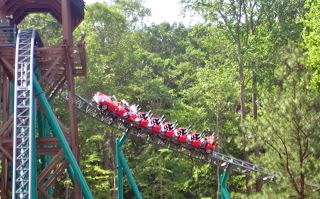 A classic Schmeck by design, the ride was moved to the park in 1994 from Canada. Thank goodness it was, as it's still giving some pretty great rides. We shall end the aerial tour of the Great Escape with a look at the Alpine Bobsleds, a coaster that both eluded me when I visited, and also is highly rumored to be removed soon. It is pretty fun to stand in the queue line, which weaves under the middle of the ride, and watch the trough sway as the cars pass by! For more info on the Great Escape check out this story we did from our visit, and for a link to the aerials's on Google, click here. With one final crash, all of the major structure of Son of Beast at Kings Island has fallen, permanently removing the ride from the theme park's skyline. While the coaster hasn't operated in some time, it still will be a bit odd seeing Kings Island without the once world breaking coaster towering over the left side of the property. Now that almost all of the ride is down, is it okay to start to wonder what the park will do with all that land? Six Flags and Premier receive Best New Ride award for Superman Ultimate Flight(tm). From left to right, Lana Magilner, Sara Ingram, Jim Seay of Premier Rides, CEO Jim Reid-Anderson, Tom Iven, Walt Bowser, and John Odum of Six Flags. 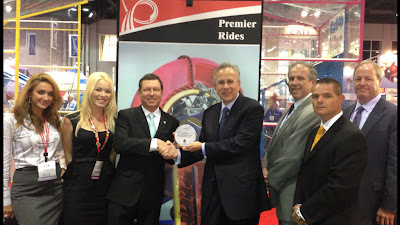 One of the most coveted awards that are given out during the annual IAAPA trade show is that of the Best New Product, and this year Premier Rides is proud to have taken the title with their innovative Superman Ultimate Flight attraction at Six Flags Discovery Kingdom. The unique roller coaster features the tallest inversion West of the Mississippi, and includes several launches, a twisted heartline inversion taken high above the ground, ascending and descending twists, and two vertical rolls. Superman Ultimate Flight starts as trains are launched from the station up to 65 feet, then drop backward and are accelerated backwards to a height of 80 feet. Falling forward, a final launch pushes the train up to the top height of 150 feet where the train slows as it enters the heartline roll. 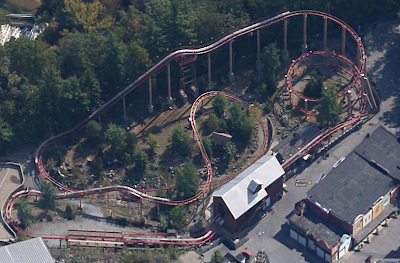 A vertical drop comes next, ending in a twisted loop featuring approximately three and a half Gs. 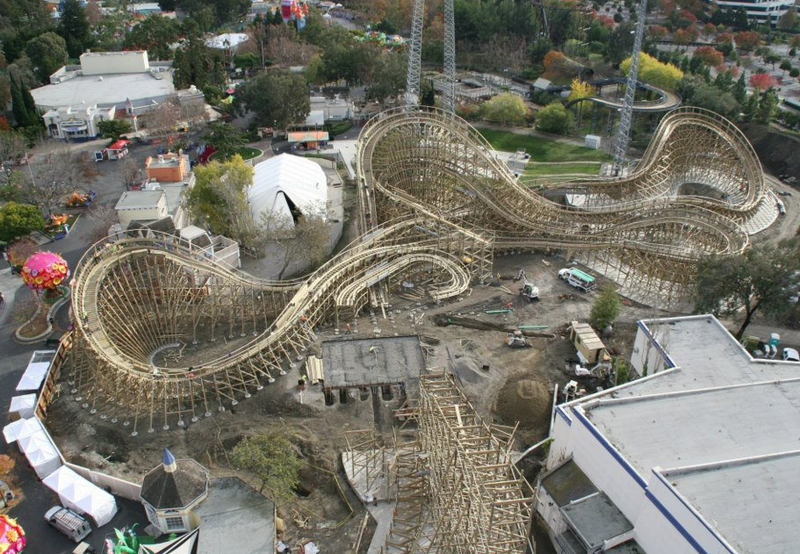 Six Flags and Premier Rides have teamed up again for 2013's Full Throttle at Six Flags Magic Mountain, which will feature a "world record loop where the trains travel on the inside and outside" of the element. The following Geauga Lake advertisement is a bit sad all things considered, but that's not where we are headed with this. I actually featured this ad here on NPN some five years ago, but the photo quality was poor at best. Hey, I tried! With improved technology I thought it was worth another glance, if for no other reason to act as a segue for next week's Vault. Serial Thriller: It thrills again and again and again. How silly. It was a fun idea, though, and naturally we know that some folks wouldn't agree that the ride was much fun. 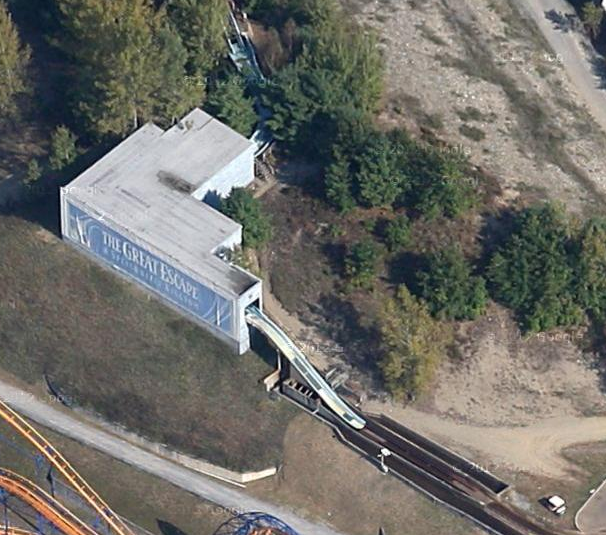 If you'd like to test it out you can simply visit Michigan's Adventure where the coaster is now Thunderhawk. As for why this advertisement leads to next week's Vault, that's because it is from a visitor's book from Sea World Ohio, remember when that existed? We'll head back in time to check that out next week. Disney's Hollywood Studios is now previewing their latest attraction, Pirates of the Caribbean: The Legend of Jack Sparrow, to guests of the park before it officially opens on December 6th. I didn't follow the announcement of this attraction too closely, and honestly wasn't too sure what it was until videos of it started appearing online yesterday. Orlando Attractions Magazine filmed the experience, so if you do not want to know just what takes place, then skip this video! As you can see, the attraction mostly relies on audio, lighting, and video effects to entertain. I have to wonder if small kids might have a bit of a cry-fest in this one, the combination of loud and dark usually have that result. The projection of Jack Sparrow is particularly nice, very similar to the characters in Universal's Forbidden Journey queue line. While the attraction is by no means a big marketable addition, it's certainly nice filler for the Studios, which could use it. I love how it pokes fun of itself, too, as Jack departs with "come back in eight minutes and we'll do it all over again." The debut of Silver Dollar City's Outlaw Run ride vehicle - aka the stage coach - at IAAPA made quite a splash, so much so in fact that the park put together a neat video about the experience. The highly anticipated ride is sure to make waves once it opens next year, as guests get their first shot at trying out the unique double barrel roll, 81 degree drop, and several instances of extreme banking. Shifting to a very cold attraction in a very hot state, we move to Antarctica at SeaWorld Orlando. 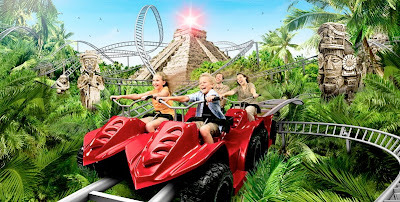 The ride's unique ride vehicle was also unveiled for the first time at IAAPA, but now the park has sent out a new video showing off even more of the ride. Did you catch the little peek at the ride vehicle in motion toward the end? Gives a nice idea of how the motion base aspect of the attraction will play out. With more concept art being shown in each video, combined with seeing the vehicle in action, I'm getting more excited for this attraction - looks to be quite unique and also quite an undertaking! WhiteWater had a very good IAAPA experience this year, taking home a record three Brass Ring awards. Two were given to the water attraction manufacturer in the category of Best New Product - one for the AquaCourse and one for the SilkGel Technology, used in water slides. A third was given out for Best Exhibit, which went to the recently acquired Hopkins Rides. AquaCourse "challenges guests to traverse through an exhilarating aquatic course of ropes, towers, bridges, water cannons and other interactive water features. With multiple tracks that offer varying degrees of water and exploration, AquaCourse is a true family adventure." WhiteWater's SilkGel comes with a ten year warranty against fading and chalking, and the one-of-a-kind product is now the standard for every flume created by the company. The company's President and CEO, Geoff Chutter said "Wow! 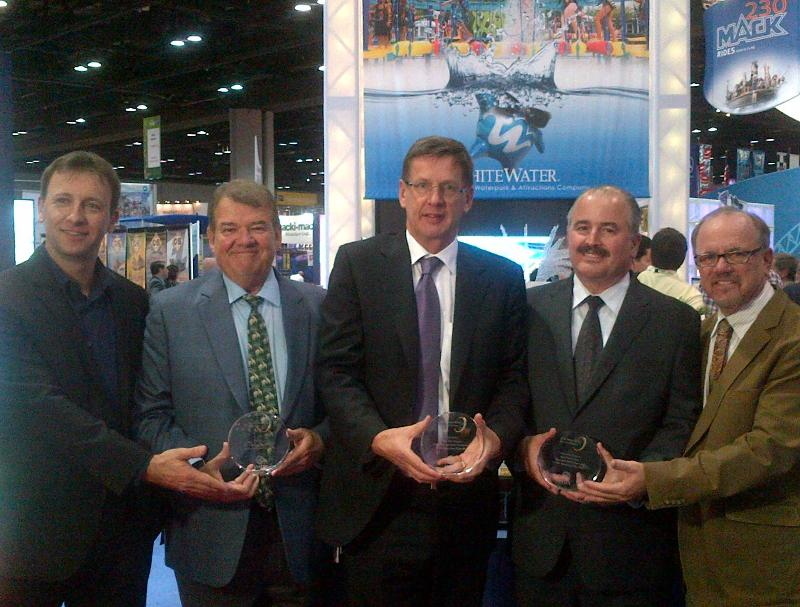 This year's IAAPA Expo is one for the WhiteWater history books! We are honoured and pleased to be awarded three awards this year, as it really reinforces our growth and focus on being the ORIGINAL Waterpark & Attractions Company."